Home NEWS The Westin Zagreb hotel gets a brand new look! The Westin Zagreb hotel gets a brand new look! To continue offering a unique and refreshing experience to its guests, the public spaces, accommodation units and meeting capacities at The Westin Zagreb are currently undergoing substantial renovation. With the new, modern and revitalized look, combined with the everlasting, timeless Westin elegance, the hotel’s facilities will be greatly upgraded. The hotel’s interior will be completely aligned with the stylish, newly released, Westin global brand and design standards, yet inspired by the local heritage and culture. The prominent London architecture studio Scott Brownrigg ensured Westin’s interior is done according to the latest trends in design and hospitality industry. Its bright rooms with breathtaking city line views will get a much modern look while the restaurant and bars will be bathed in a neat, but warm atmosphere depicted with light brown and turquoise colours. 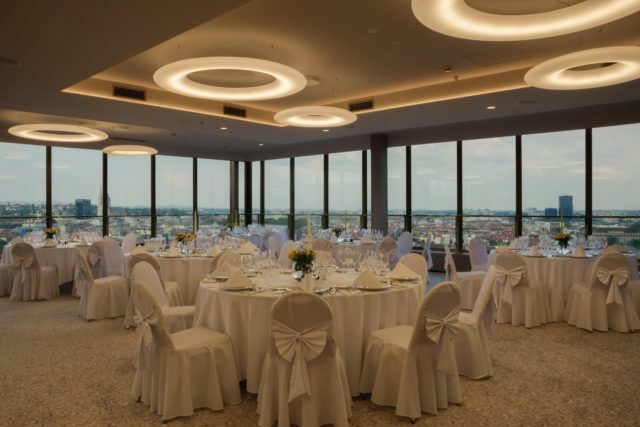 The famous event capacities on the hotel’s 17th floor, that have always enjoyed breathtaking sights of the city of Zagreb, will now feature modern lightning and completely unobstructed views as far as the eye can see. The feeling you will get on the ‘refreshed’ 17th floor is as if you were literally on clouds above Zagreb. Imagine your event in a setting like that! The Westin Zagreb has remained open throughout the entire refurbishment period, continuing to provide excellent service and minimizing any potential disturbance for its guests. The size of the renovation investments is roughly over 5 million Euros. The Westin Zagreb hotel is expected to welcome guests with its new look in autumn 2016.